Whether you have an original idea for a piece of jewelry, an antique you’d like to have restored, or loose stones that you want to incorporate into a piece, Master Jeweler Chad Elliott can translate your concept into a finished piece. Starting from one-on-one conversation and sketching, we lay out the entire process, from design, to modeling, casting, and finishing to match your concept and budget. When you want a custom jewelry design for an engagement ring, wedding band set, pendant, neckpiece, or any other custom jewelry, the design process at Oceanside Jewelers starts with a conversation with Award-winning Master Jewelry Designer Chad Elliot to get a feel for the type of design you like and how your jewelry fits into your lifestyle. What type of jewelry fits your style? Do you like antique reproductions or a modern, clean look? Do you have an active lifestyle where your jewelry gets a lot of wear and tear, or is the piece something that you’ll want to show off on special occasions? Even body type fits into the equation — a large, heavy piece can overwhelm a petite hand, and an airy, delicate style can look out of place on someone heftier. We will also ask about what components of the jewelry design you want to emphasize: are you looking for a stunning gemstone in a simpler setting, or are the workmanship elements of your custom designed rings just as important to you as the gemstones? 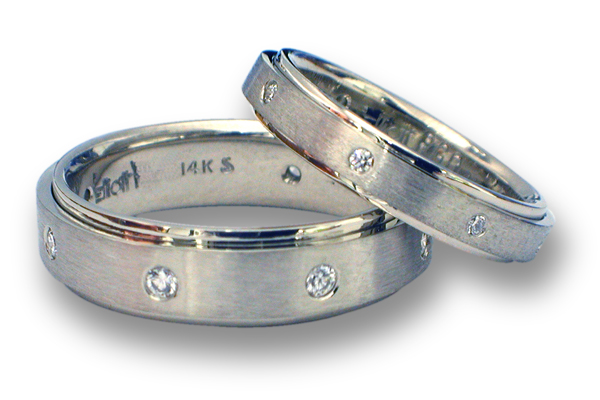 Perhaps you want a gold or platinum ring with no gemstones, or you have gemstones from a family heirloom that you want to incorporate into custom designed rings. Your answers to all of these questions will help us determine the best jewelry design for you.You can also get complementary pieces made to go with custom designed rings you already have, or do a restoration or remodel incorporating an existing piece of jewelry, such as adding additional gemstones or diamonds, rebuilding an area that has worn down, etc. Master Jewelry Designer Chad Elliot is an award-winning designer who has won the American Gem Trade Association AGTA Spectrum Award and Platinum Guild International Platinum Honor at the prestigious Tucson Gem Show in Arizona, and has myriad resources available to give you ideas for your custom design. In our showroom you can look over literally hundreds of high-quality photos of jewelry from our design portfolio, a large selection of custom designed rings and other jewelry on display, and catalogs featuring many variations of traditional and contemporary designs. If you have photos of designs you like, please bring them in. You can even bring multiple photos emphasizing different aspects of designs that you like — for example the top of one ring, the prong design of another, and stone color of another. We can incorporate all the design elements that you like into a ring, pendant or other custom made jewelry piece that blends everything together harmoniously. Using all these resources and your ideas, we will make hand sketches showing your custom jewelry design from the top, side and profile, revising as necessary until you are satisfied. The next phase will be to decide whether your piece will be cast using a handmade model or a computer-generated (CAD) model, or hand fabricated. Award-winning Master Jewelry Designer Chad Elliot, one of the country’s top jewelry designers, will guide you in this process, calling on over 20 years of jewelry manufacturing experience to recommend the best process for making your custom jewelry design come to life. When does cost factor in when you design jewelry? There are myriad variables in the design and manufacturing of custom jewelry that can be modified so the design you want can fit any budget. Some of them are: using different qualities of stones or different sizes of stones, using hand finishing and engraving techniques to give the look of small gemstones, using less metal in the interior of a ring, or designing different parts of the ring in different metals to play up features that are important to you. Another value-conscious decision can be opting to order your mounting as unfinished or partially assembled components from one of the many catalogs we have available and customizing it with diamonds and gemstones of your choice and other finishes such as hand tooling and engraving. The entire process once a design is chosen until your jewelry is ready to take home takes approximately three to five weeks depending on the complexity of the design. You are welcome and encouraged to be a part of this process from the beginning to the end and can view your custom design at any stage in the process from the modeling, casting and manufacturing, through to the setting, finishing and polishing. Once completed your one-of-a-kind custom made jewelry will be photographed and is then ready for you to take home and enjoy for generations to come!